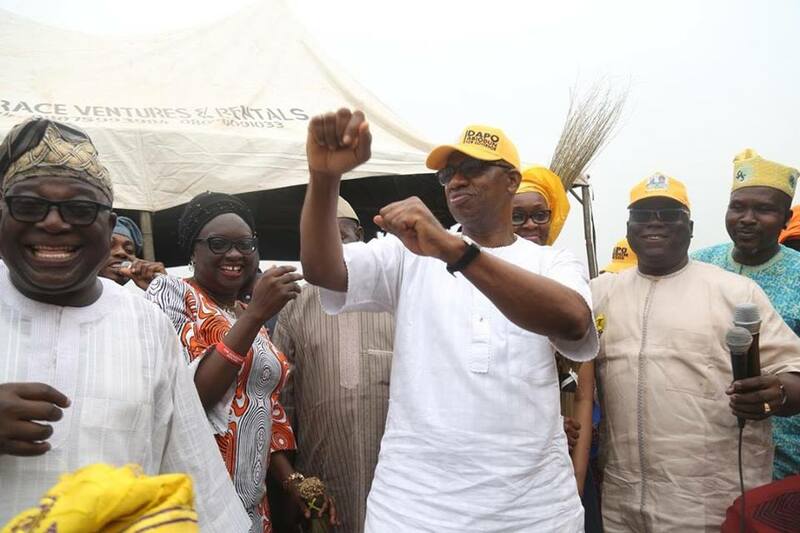 The governorship ambition of the Ogun State All Progressives Congress candidate, Prince Dapo Abiodun receives yet another significant boost as the Owu people in Ijebu East local government declared their support for his candidacy. This occurred at a rousing reception organized for him during his ward to ward campaign tour of the local government. Speaking on behalf of the entire community, the Atunluse of Owu Ijebu Kingdom, Otunba Femi Adewunmi explained that they were throwing their weight behind the successful entrepreneur because has experience in successful management of various businesses and they were confident that he would take the State to enviable heights. He said, ‘Our incoming governor, i want to gladly tell you that the people of Owu Ijebu Kingdom are solidly behind you and we would influence all our other kinsmen across the State to do same. This is because we have seen you as an experienced business man who has been successful in his businesses and it won’t be difficult for you to take this State to a greater heights’. He further stated ‘we are assuring you of our maximum support with our resources to ensure you emerge victorious in this local government and the state at large. We are urging you to make sure you fulfill most of your electoral promises and give a new life to the people of Ijebuland and Ogun State at large. In his response, the gubernatorial hopeful who was marveled at their support assured them of good governance and even distribution of government projects across the board state when he becomes governor. He said, `I want to sincerely appreciate you for this colorful reception, it is an indication that God is truly with us on this project. I also want to assure you that your support will not be taking for granted and we will ensure that this is reciprocated through provision of good governance that will enhance good lives for both dwellers of urban and rural areas of the State. Earlier, the campaign train of the business mogul moved round the local government from Ijebu Imushin to J4 to Ebute Odo to Ogbere and Itele before their grand finale at Ijebu Ife. The people of the local government area were enthusiastic and show their readiness to support the candidate. The support became obvious at itele Ijebu when the market women and artisans of the local government threw their weight behind the APC governorship candidate.